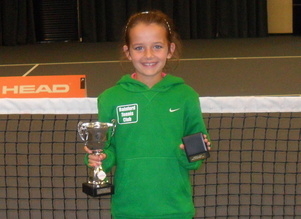 Maisie Lavelle has won the 8 & Under Girls Singles at the 2011 Lancashire Tennis Championships and is the first ever County Champion in the history of Rainford Tennis Club. Maisie won all of her matches at the tournament, which was played on the indoor courts at Bolton Arena, with players from across the region competing in junior, adult and veterans events. Maisie, who also reached the semi-finals 9 & Under Singles, won all of her matches including a 10-8 victory over Jhonayah Fletchman from Manchester in the final to lift the 8 & Under trophy. “All of Maisie’s hard work this summer paid off at the tournament and she played very well” said her coach, Dave Hillier. Rainford Tennis Club were well-represented in the draw with players from the venue competing on every day of the ten day tournament. Conor Porteus, Andrew Corish, Dave Hillier and Simon Webster all won matches in the Men’s Singles and Doubles with Conor reaching the fourth round only losing to fourth seed and Lancashire Men’s Captain, Andrew Davies. Adam Ashton, Cameron Ashley-Jones and Joe Machin also competed in the various junior draws enjoying some impressive performances during the tournament.